We caved to temptation. We are now Blue Apron customers. 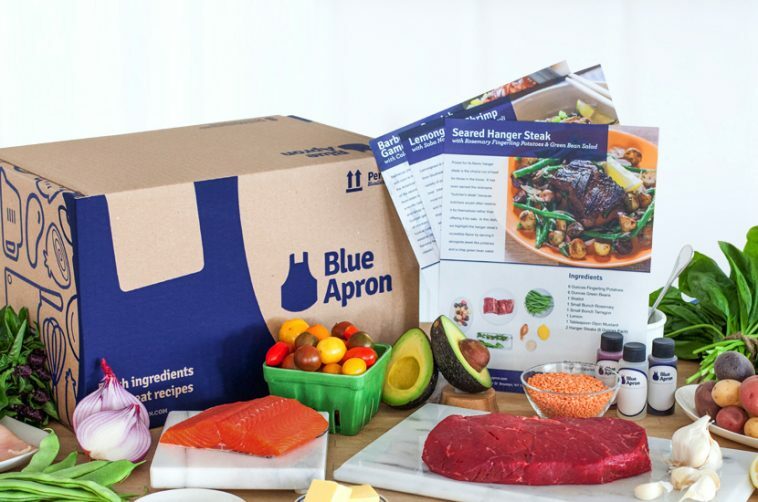 Blue Apron is a relatively new service (started in 2012) that supplies meal kits—pre-portioned ingredients and recipes—shipped in a box right to your door. Yesterday I came home to a box waiting for me on the front stoop. I opened it up to find, packed on ice packs and wrapped in an insulating bag, two meals for four: late summer beef Bolognese and roasted chicken with teriyaki vegetables. Every little thing we need to make these meals is provided, including spices and a dab of flour in the “knick knacks” bag. Now all we have to do is follow the instructions on the beautifully laminated, lavishly photo-illustrated recipe sheets, and voila: excellent cooking. I call this “caving to temptation,” but last weekend, Ron and I had a lovely time whipping up the last shipment’s meals together, listening to music while we cooked, dividing up the chopping duties. It was the dream: the pleasure of food without the downsides—no grocery shopping, no planning, and no putting up with the various nuisances and disappointments of restaurant eating. Blue Apron is selling an experience. They’ve developed a super-smart, zeitgeist-sensitive business plan that addresses the reality of our busyness as well as our desire to imagine we are Michael Pollan-hip, skillfully cooking at home with fresh ingredients. According to an excellent article in Fast Company magazine, Blue Apron and its competitors have hit on a successful formula. Blue Apron has raised $2 billion in investor cash and delivers two million meals per month. While meal kit services are likely to remain a small sliver of our food economy, evidently, for now, people love ‘em. I’m surprised to discover that what I like most about this service is not the fancy food (don’t need it) or the cooking instruction (already know how to cook). It’s the lack of choice. For our two meals per week, we get four choices. That’s it. Frankly, it’s a huge relief. I am tired of choice. In the food arena alone, these days, we have overwhelming choices. The grocery store is a nightmare of choice. That’s why I hate shopping. Meal planning sends me into a state of languid apathy: I just can’t get myself to care enough to put the choice-energy into it. Restaurants, besides being expensive, are also problematic in the choice department. One of the things that really grinds my gears is dithering with a group of people over where to go to eat. And once a restaurant is chosen, I have been known to research the menu ahead of time in the privacy of my home because I have a hard time making choices and socializing at the same time. Moreover, because of my work responsibilities, my life is full of difficult decisions and choices all day long. No doubt these meal services have read the research that tells us people have only so much choice capacity per day, just so many choice-o-trons to spend on the day’s decision-making. Sugary foods evidently help (seriously! ), but there’s still a limit. We all have to find ways to conserve our choice-o-trons for the matters that matter most. University of Michigan head football coach Jim Harbaugh famously wears khaki pants every day in order to save his choice capacity for more important things like run game options when the defense stacks the box. The late Apple CEO Steve Jobs used the same choice-reduction strategy with his closet full of jeans and black turtlenecks. Of course, choosing not to choose is also a choice. Decision fatigue research has also found that one of the most exhausting things for people in poverty is making difficult trade-off choices. Soap or beans? Medicine or food? Bus fare or a coffee? Even the choice to narrow my choices is an exercise in privilege. Blue Apron is not about saving money, that’s for sure. Meals wind up costing us about eight bucks a serving, making the company’s mission statement–“to make incredible home cooking accessible to everyone”—rather laughable. This is a luxury for people who can afford it. I do feel some guilt about using this service. Luxury guilt, for sure. Also guilt for not practicing thrifty homemaking such as my mother used to model, heading out to the grocery store each week with cash, looking for bargains, clipping coupons, buying in bulk, watching the budget. Unfortunately, thrifty homemaking takes time, it turns out, and Mom had that time. Ron and I do not. We both work full time. And we choose to do other things with our off hours. We have that choice, too. As for other kinds of guilt that enlightened food-systems-savvy people might feel, Blue Apron offers much reassurance. The packaging, of which there is plenty, is recyclable and/or reusable. Their food sourcing, the website claims, strives to develop virtuous sourcing practices. You can find photos of smiling farmers on their lush family farms. Who knows how long this novelty will last for us? For two people who have spent a lot of years meal planning, shopping, and cooking, who are out of ideas, time, and choice-o-trons, it’s a nice relief. Meanwhile, we’re learning new recipes now, and saving all those gorgeous instruction cards. We three-hole punch them and put them in a binder. Oh, and how does the food taste? Well, last week, we whipped up crispy Cajun catfish, which I never would have chosen in a million years. But you know what? It was mighty tasty.